Sony Global - News Releases - Sony launches “α” CLOCK for Mobile*1 with new “Time-shift UI” Enjoy High Quality “World Heritage” Photos Captured with “α” Interchangeable lens digital Cameras. Sony launches “α” CLOCK for Mobile*1 with new “Time-shift UI”Enjoy High Quality “World Heritage” Photos Captured with “α” Interchangeable lens digital Cameras. 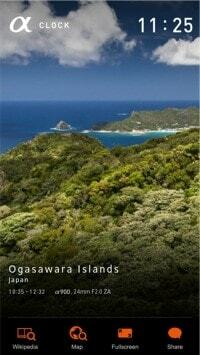 Enjoy High Quality “World Heritage” Photos Captured with “α” Interchangeable lens digital Cameras. Tokyo, Japan - May 31, 2012 – Sony Corporation (“Sony”) today announced the global launch of “α” CLOCK for Mobile*1, a free Android smartphone application available on Google Play™, which enables users to enjoy high quality "World Heritage" fixed-point photos captured with “α” Interchangeable lens digital cameras. 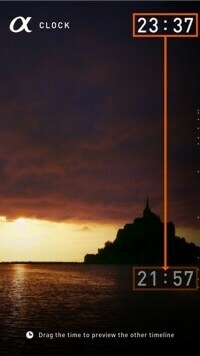 “α” CLOCK for Mobile*1 incorporates Sony’s own “Time-shift UI” and offers a new photo viewing proposition by allowing users to enjoy beautiful scenery through the natural course of time. *1: Available for Android 2.2 and greater devices with screen resolution of 480 x 854 pixel or 720 x 1280 pixel, as well as Walkman Z series. Excludes tablet devices. Contents may not correctly display on devices which do not meet the above conditions and specifications. More than 70MB free phone memories are recommended. 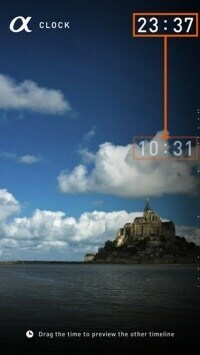 “Time-shift UI” is Sony’s own user interface technology which allows users to enjoy photos captured at different times of the day by vertically sliding the time display. “α” CLOCK content includes "World Heritage" photos captured through fix point shooting with “α” Interchangeable lens digital cameras, so that users can experience and enjoy “Time-shift UI”. Users can activate Time-shift mode by vertically sliding the time display to marvel at "World Heritage" photos captured at different time of the day. Users can also take in panoramic views by horizontally sliding the photos. 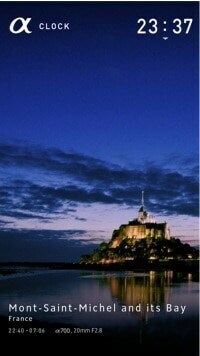 A photo of ‘Mont Saint-Michel’ in France is preinstalled with this application so users can immediately experience “Time-shift UI”. 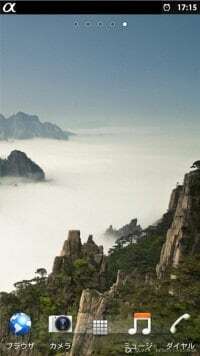 In addition, photos from the following four World Heritage sites are available for download (historical area in Istanbul, Turkey; Mount Huangshan in China; Ha Long Bay in Vietnam; Ogasawara Islands in Japan). New content will be added about every two weeks to offer a total of more than 40 photos. By activating the wallpaper switching function in the application setup menu, users can automatically set the displayed content as their wallpaper on their Android™ device. Fixed-point photos of "World Heritage" sites change 12 times*2 throughout the day. *2: Time of day when change occurs depends on the contents. 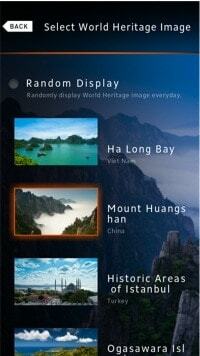 “World Heritage” content can be displayed in high resolution on devices with HD screens such as Xperia™ S which is offered by Sony Mobile Communications. Users can check relevant information on Wikipedia™ and more, or post comments on Twitter™ and Facebook™ directly through the option menu in the application. Furthermore, users can unlock special content through the “collection album” feature by posting comments on Twitter™ and Facebook™. 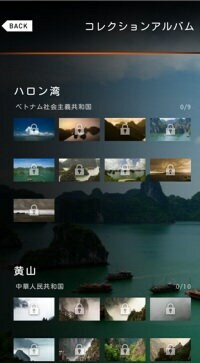 Special content includes photos of "World Heritage" sites taken from different angles which can also be set as wallpaper for the home screen, offering users incentives to enrich their “collection album”. *3: “Time-shift UI” is not applicable for special content. 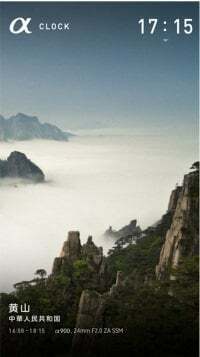 Names of "World Heritage" sites, countries and setup menu are available in Japanese, English, Korean, traditional Chinese, simplified Chinese, Russian, French, German, Spanish, Italian, Portuguese and Dutch. “α” and α are trademarks of Sony Corporation. “WALKMAN” is a registered trademark or a trademark of Sony Corporation. “Xperia” is a trademark or registered trademark of Sony Mobile Communications AB. Android, Google Play are trademarks or registered trademarks of Google Inc.
Facebook® is a trademark or registered trademark of Facebook Inc.
Twitter® is a trademark or registered trademark of Twitter Inc.
Other company or product names cited are trademarks or registered trademarks of their respective owners.